Full post-production for CBeebies Bedtime Story read and signed by Rob Delaney - Timeline Television Ltd.
Comedian Rob Delaney will read and sign this Friday’s CBeebies Bedtime Story – edited by Paul Tovee and dubbed by Daniel Piggott at Timeline’s dedicated post-production facility in the heart of MediaCityUK. Rob Delaney will read Penny Dale’s Ten in a Bed. He will be the first person to sign a CBeebies Bedtime Story using Makaton sign language as a tribute to his late two year old son with whom he used the language to communicate. 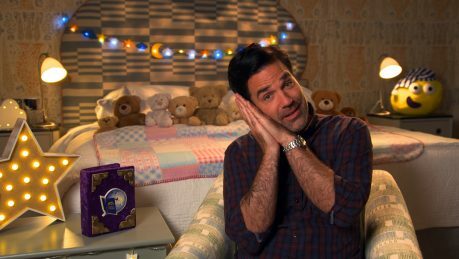 Rob Delaney joins the list of celebrities who have presented a CBeebies Bedtime Story, including Tom Hardy, Elton John, Ewan McGregor and Dolly Parton. Read more about our post-production services.